HOUSTON (AP) The greatest quarterback in NFL history led the biggest Super Bowl comeback to be the MVP on Sunday night. 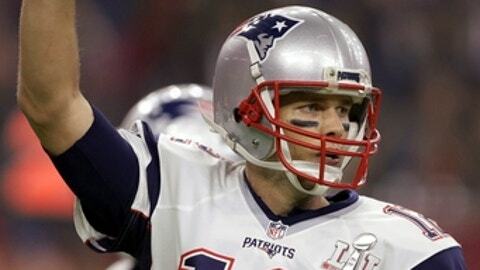 Tom Brady rallied New England from a 25-point third-quarter deficit for a 34-28 win over the Atlanta Falcons in the first overtime game in Super Bowl history to earn his fifth Super Bowl title and fourth MVP trophy. ”They’re all sweet,” he said. ”They’re all different and this was just an incredible team and I’m just happy to be a part of it,” he said. Brady threw touchdown passes of 5 and 6 yards in the second half and tied things at 28-28 when he connected with Danny Amendola on a 2-point conversion with 57 seconds left. He then directed the drive in overtime which ended with a 2-yard run by James White to make the Patriots the first team to win a Super Bowl after trailing by more than 10 points. His performance certainly wasn’t without its struggles. His incredible second half and overtime came after a first half where the Patriots managed just three points and he threw an interception which Robert Alford returned 82 yards for a touchdown. He was hurried and harassed for much of the games. The Falcons sacked him five times and hit him on another eight occasions. He noted the beating he took when he was trying to recount the details of the comeback and couldn’t remember what the score was at one point in the rally. His 466 yards passing are a Super Bowl record, surpassing the 414 yards Kurt Warner had 17 years ago. He also set a record for most passes completed in a Super Bowl with 43 and most attempts with 62. He is the first to play in seven Super Bowls and the victory ties him with Charles Haley for most Super Bowl rings. After all Brady has done in his career, was this his finest moment? It’s a triumphant end to a difficult season for Brady, who missed the first four games because of his ”Deflategate” suspension and dealt with his mother Galynn Brady suffering through an undisclosed illness. The Super Bowl was the first game she’s attended all season. He shared a quick moment with her right after the game, but was looking forward to more time with her in the upcoming days. ”It’s kind of madness after the game so I didn’t get much quality time with her but we’ll get it this week,” he said. But he certainly wasn’t asking for sympathy for his rough road to this title though, chuckling when someone asked about the adversity the Patriots have gone through in the past couple of years. Brady also collected the MVP trophy in 2001, 2003 and 2014. ”It was just a lot of mental toughness by our team and we’re going to remember this one for the rest of our lives,” Brady said.